With entire business processes being digitised, the requirement of a traditional wet-ink signature on documents serves as an impediment to cutting down on the time and costs associated with the processes. An electronic signature, on the other hand, allows organisation to execute a paperless environment consistent with today’s increasing digital workflows. Xeratek Document Solutions is introducing electronic signature software in the UAE that can be easily integrated into your organisation’s existing systems, while offering the added benefit of insight from detailed reports and easy tracking of transactions. Kofax SignDoc® is an electronic signature software that is safe, reliable and easy to use. 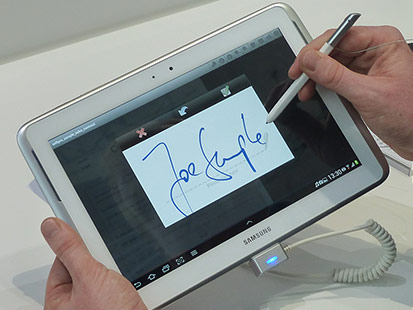 With a wide range of applications, the software allows for digital signatures to be executed in various settings — the user can be present at an office location, connected through video or audio or be using a remote self-service device. Realise a complete digital transformation of your organisation, improving customer experience while cutting down costs. Kofax SignDoc® allows your customers to electronically sign documents at their preferred time and place and using a digital device of their choosing. By offering this improvement in customer experience, your organisation will benefit from improved relationships with customers. By enabling your organisation to effect a totally paperless environment, Kofax SignDoc® decreases both manual work and paper costs, saving you money in the long term. Documents can be rapidly created, transmitted, monitored and signed through electronic means, and also embedded into business applications and workflows for further processing and storage. Kofax SignDoc® makes contract completion and approvals a quicker process by enabling signatures to take place remotely. As Kofax SignDoc® facilitates faster contract signing, it allows your organisation to seal deals more rapidly than before. By making signing a faster and easier process, e-signatures can translate to more sales for businesses. Kofax SignDoc® offers security features like multi-factor authentication, digital certificates and signature biometrics, thereby eliminating the risk of fraud during signing ceremonies. An e-signature bears clear proof of who the signatory was, the contents of the document that was signed and the date and time of signing. With an easily tracked audit trail, Kofax SignDoc® ensures that your organisation complies to legal requirements through all process steps and transactions. Ready to Switch To Electronic Signatures for Your Organisation’s Complete Digital Transformation? Let’s get started.